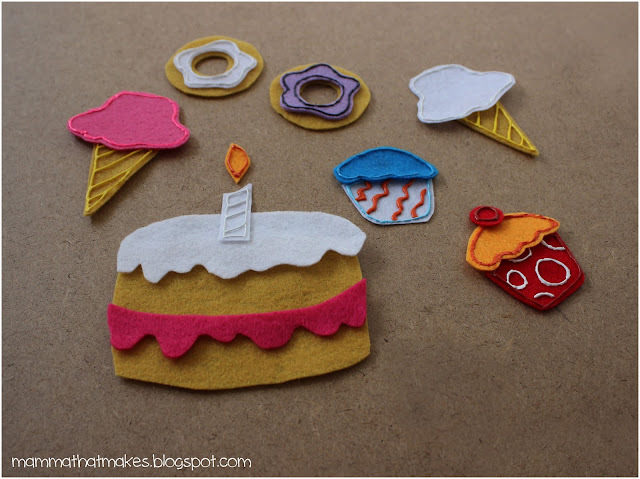 The Sweet Treat felt set comprises of donuts, ice-cream, cupcakes and of course cake! Because no dessert set would be complete without some good old fashioned layer butter cake! Om nom nom. First, gather your supplies. You'll need some felt, some scissors, and if you like some paint! I use fabric puff paint, but really, most would work just fine. 2: Cut out the templates from the paper. 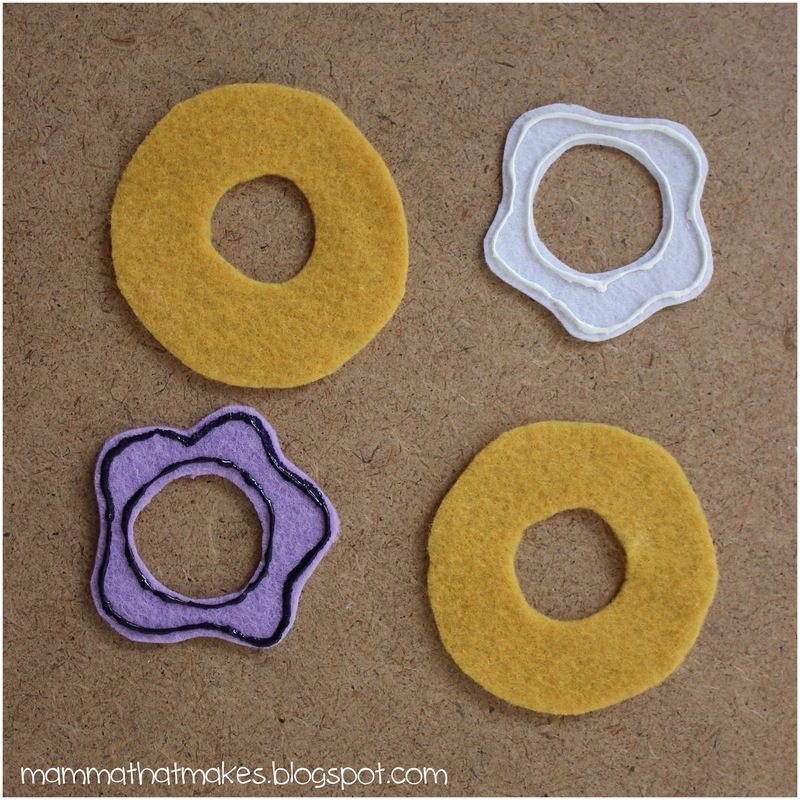 Then, you can either use them to trace around with a pen onto the felt, or pin them to the felt. I prefer to trace, it's much easier. 3: Cut all the felt pieces out. You may want to cut more than one of each thing. We made 5 candles, 3 donuts, 2 cakes, 4 different cake frosting "flavours" and a heap ice-cream scoops and cupcake pieces! Because mixing and matching is fun! 4: Optional. If you want to add more detail to your pieces, this is where you get the paints out! For the ice creams, I outlines the scoops in a matching colour, and added some detail on the cone with diagonal stripes. Waffle cones would look great too! You could also add sprinkles with paint, or choc chips, as well. 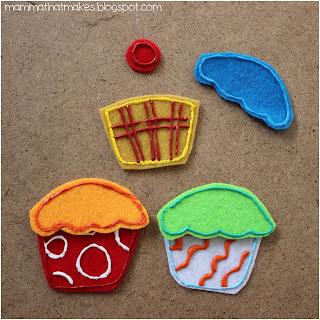 I didn't, because I cut some leftover felt up into tiny strips to use as sprinkles. Make extra scoops for stacking fun. For the donuts, I only outlined the icing, and not the actual donut. 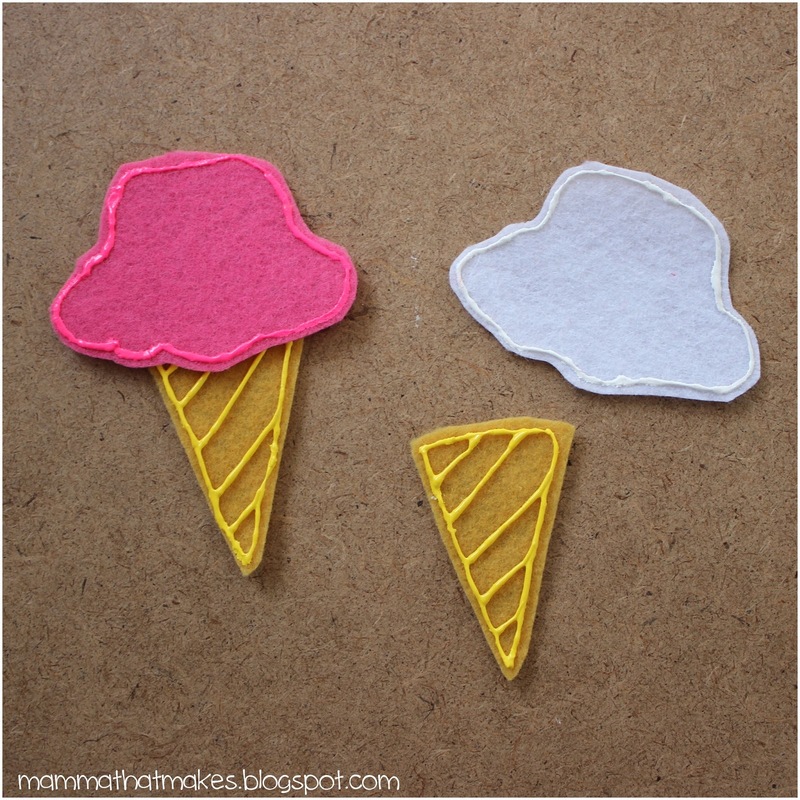 Again, you could add sprinkles to these too, and a whole variety of colours! 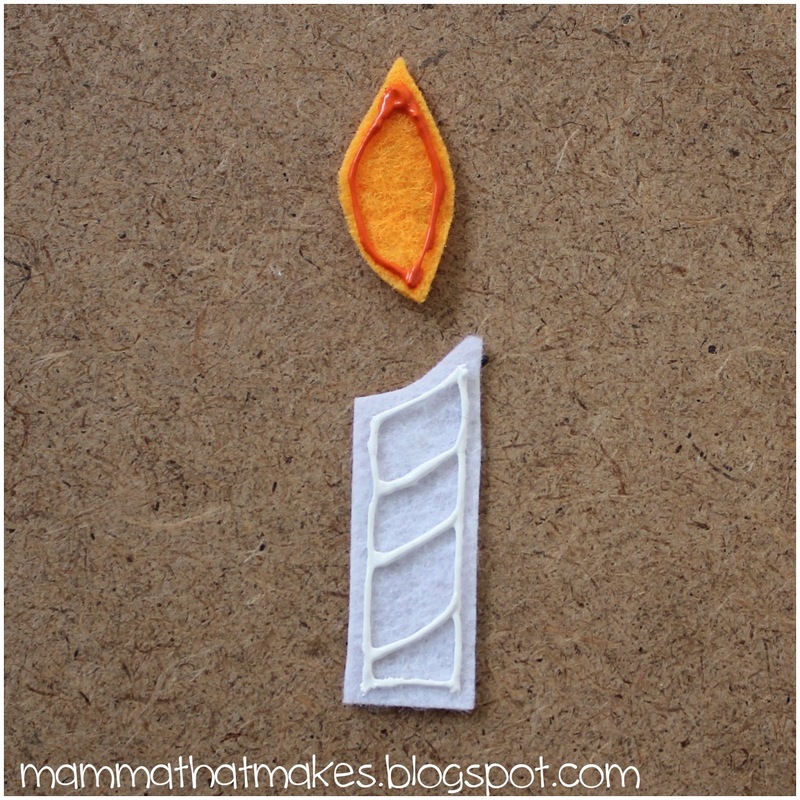 Candles! Such fun little additions. I made 5 initially, but I want to go back soon and do some more. 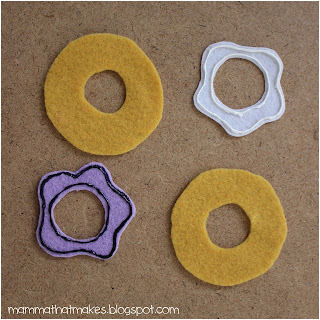 They are excellent for counting! 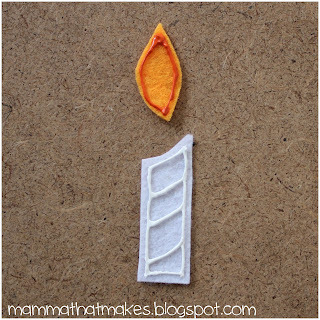 I outlined both the flame and the candle, and added some lines to give it that swirling texture that birthday candles often have. I didn't outline the cake pieces. Mostly because so many other decorations usually get placed on the top, that I thought leaving them plain would create more open ended options for play. We've had sprinkles, candles and cherries from this set, but we have also put numbers and letters on the top of the cake, and fruits from another felt set. Oodles of fun! Cupcakes! I have the most fun with these ones, because there are oodles and oodles of designs you can put on the cases! Try spots, dots, lines, stripes, flowers and even stars! 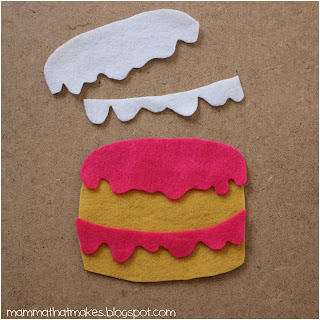 Don't forget to make a few little cherries/berries for the tops! After all, decorating cupcakes is always a lot of fun. That's it lovelies! That is the Sweet Treats set all done! Wait for all the paint to dry overnight and it's finished.